I’m joining in with hundreds of other writers online in The Nester’s 31 Day Writing Challenge. 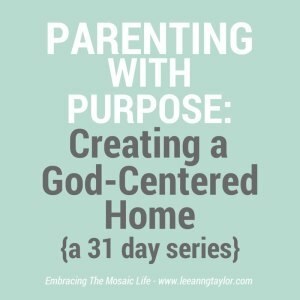 This is my first time participating and I’m excited to share with you this series on Parenting With Purpose: Creating a God-Centered Home. This means I haven’t gone through all the stages of parenting and still have lots to learn! I struggle daily as I strive to make the best choices for and with my children. I’m learning to embrace a graced-based approach to parenting. There are hundreds of ways to create a God-centered home and I’ll be sharing 31 of them, so this won’t be an exhaustive list! Learning often happens best in community! If you’re not already receiving blog posts by email, you can sign up to follow along with the series and have the posts delivered right to your inbox so you don’t have to remember to click over to the blog each day. If you like to follow along in a blog feed-reader, you can connect with me on BlogLovin’. You can also connect with me on Facebook, Twitter, or Pinterest. If you’d like to dig deeper into the topic each day, join the private Facebook group to connect with other parents and grandparents who are also passionate about creating a God-centered home. If you have a friend who would also be interested in this series, please invite them to join us on the journey! You can also pin the series button to Pinterest to refer to later as you grow in your parenting. Hi Lisa, nice to meet you! I’m excited about the community of moms this series will bring together. I know we will all encourage one another along the way! I feel like this is something I really struggle with. I’m happy to follow you throughout the month! Hopefully your bits of wisdom will help us create better habits! Found you via 31 Days. I’m so glad you’ll be following along this month! If you’d like a little more interaction and support surrounding this topic this month, we’d love to have you join the private Facebook page: https://www.facebook.com/groups/1539187812983140/. Leeann–so excited about this series. This is my passion, too! 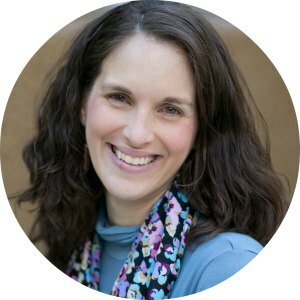 I’ve followed your blog for awhile now and have always loved how we share the ability to create spiritual discussions out of the most mundane things! My husband and I refined that skill before we had kids when we were leading youth retreats and coming up with experiential learning experiences for the classes we taught together at Bible camp. So fun! I’m looking forward to introducing my readers to your fabulous resources later in the month too!